Professor Youngson's book is an ubiased review of Britain's past experience and present difficulties. Few sacred cows are spared. There is no pretence that fundamental problems were resolved at the time of its first publication in 1967. Many econmic historians fail in their assessment of Britian's economic prospects as there is a tendency to look only at recent events to explain current problems. Youngson saw that this was short sighted. An economy, like an airliner, cannot suddenly change its course; it is subject to persistent forces and tendencies; it is powerfully affected by what has happened in the recent and sometimes in the not so recent past. Therefore to understand the problems of today we must know somthing of how persistent they are , and about what solutions have already been tried. 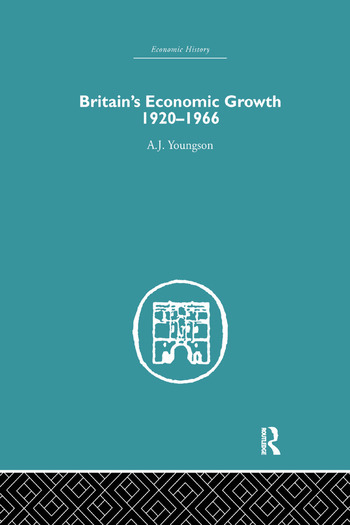 This book provides a thorough examination of Britain's economic growth from 1920-1966 and contextualises Britain's situation within its true historical perspective. This book was first published in 1967. The struggle for the gold standard; Old and new industries; exports, foreign investment and the balance of payments; The extension of government activity; Wages, trade unions and industrial relations. Government Planning, monetary policy and the balance of payments; Industrial development and foreign trage; Social policy, wages and trade unions; Comment and analysis.